Stuart Weitzman suede sandal with leather trim. 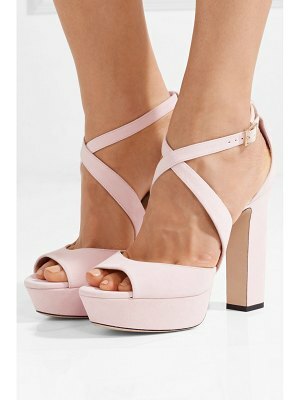 4.5" covered block heel; 1" platform; 3.5" equiv. Open toe. Caged vamp. Lace-up front ties around ankle. Padded footbed. Leather outsole. "Tiegirlbingo" is made in Spain.